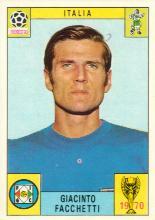 Giacinto Facchetti, one of the greatest defenders of all time, was an anomaly in the Italian football of his day. The full-back was in his prime during the mid-to late 1960s, an era when the game in Italy was dominated by a stultifyingly defensive tactical mindset. At Facchetti's club, Internazionale of Milan, the master coach Helenio Herrera turned negative play into an art form, perfecting the defensive method of play known as catenaccio. It relied heavily on strict man-to-man marking to shackle the opposing team's attacking capabilities, while relying on quick breaks to steal goals. Yet, while Facchetti grew adept at making the system work from his left-back position, the sterile system ran counter to his instincts. In truth Facchetti was an elegant footballer, a cavalier, whose nature was to attack. It speaks volumes about his adaptability, and his team ethic, that Facchetti performed so brilliantly in a side whose method was inimical to his own character. Facchetti's football career began at the lowly Trevigliese club in his home town. In the early days the tall, powerfully built young Facchetti played as a centre-forward, and he was a good enough forward to sign for Inter in that position. But Herrera had other plans for him. The coach viewed Facchetti's robust physique and strength in the air as vital components for a useful defender, and he set about converting him into a left-back. But the young player was destined to be far more than an anonymous cog in a defensive machine. His defensive colleagues were generally confined to playing rigid roles in Herrera's man-marking scheme. But the coach released Facchetti from slavish defensive duties to join the attack. The striker-turned-defender flourished in the dual role, and his skill in the position was a major factor in Inter's incredible run of success in the mid-1960s. Facchetti first played for Inter in 1961, just as the club was emerging as a European power, and Real Madrid's long-held monopoly on the European Cup was weakening. In 1963 he won his first Italian title, and the following year Inter went all the way to the European Cup Final in Vienna. In one of the pivotal matches of football history, Real Madrid's buccaneering superstars were nullified by Inter's cagey defence, with the young Facchetti outstanding, and the Italians won 3-1. The following year Inter won back the Italian title and successfully defended their European crown, beating Benfica 1-0 in Milan. Facchetti had scored the winning goal in the semi-final to beat Liverpool. That season was the high-water mark of Inter's hegemony in Europe. They won the Italian title again in 1966 and reached the European Cup Final in 1967, but in a memorable culture clash they lost 2-1 to Jock Stein's swashbuckling Celtic side in Lisbon. By this time Facchetti had emerged as one of the most inspirational captains the Italian national side had ever had. He had played his part in the débâcle of 1966 when the azzurri were knocked out of the World Cup in England by North Korea - and he took his full share of the rotten fruit hurled by angry fans at the airport when the team arrived home in disgrace. But two years later Facchetti led his country to victory in the European Championships, beating Yugoslavia 2-0 in a replayed final in Rome. In 1970 in Mexico Facchetti played a sweeper's role in a more expansive Italy side, but they had the misfortune to get on the wrong end of one of the finest footballing exhibitions of all time as Brazil won 4-1 in the Final. Facchetti was back as captain for the 1974 World Cup in West Germany, but a disappointing Italy made an early exit. He was poised to play in his fourth World Cup finals in Argentina in 1978 before injury robbed him of the chance. Giacinto Facchetti retired from playing in 1978. In January 2004 he was appointed president at the club he had served so well for so many years, and the revered Facchetti was a popular choice. He played 476 League games for Inter and won four national titles and two European Cups. He scored 75 goals, a remarkable tally for a man in his position, including an astonishing 10 in the 1965/66 season. Facchetti played for his country 94 times, 70 as captain. Cabrini has 79 and I think he was better than Facchetti in attack. IMHO 2 points between them are correct.